This is an in-depth look at 50 different spices and their curative qualities. It offers spice 'prescriptions' to match the right spice to a specific ailment. 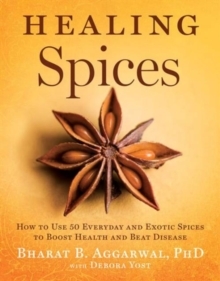 It is written by the world's foremost expert of the therapeutic use of culinary spices. Breakthrough scientific research is finding that spices, even more than herbs, fruits and vegetables, are loaded with antioxidants and other unique health-enhancing compounds. Studies of dietary patterns around the world confirm that spice-consuming populations have the lowest incidence of such life-threatening illnesses as heart disease, cancer, diabetes and Alzheimer's. Bharat B. Aggarwal, the world's foremost expert on the therapeutic use of culinary spices, taken an in-depth look at 50 different spices and their curative qualities and also offers spice 'prescriptions', categorised by health condition, to match the right spice to a specific ailment.